As a developer you want the most intuitive and hassle-free suite of tech tools available — so that you can get on with your work without having to constantly manage it. 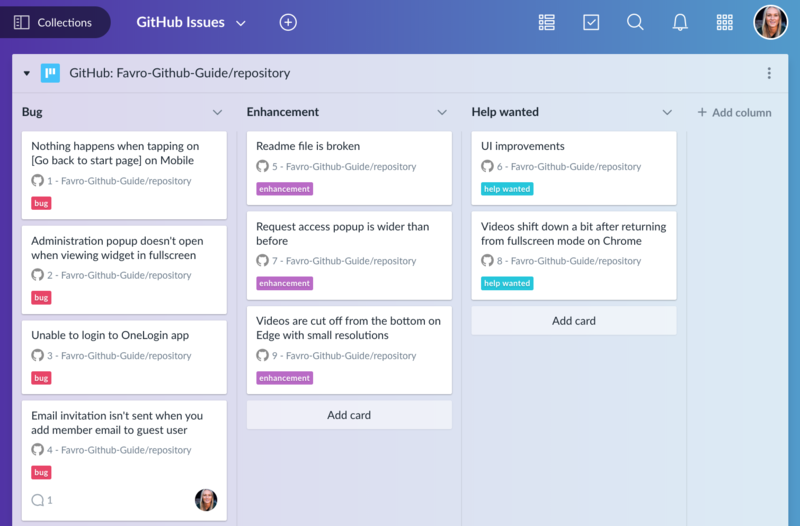 Our GitHub Integration allows everyone on the team to stay updated on what's currently being worked on by syncing your issues and pull requests to a backlog or board in Favro. First you need to enable the GitHub Issues integration from the Apps and integrations screen from the 3x3 dots icon next to your avatar. Then connects to your Github account by clicking Profile and account..., Accounts and Connect to GitHub Issues. On the next page you will be asked ot sign in to your GitHub account. 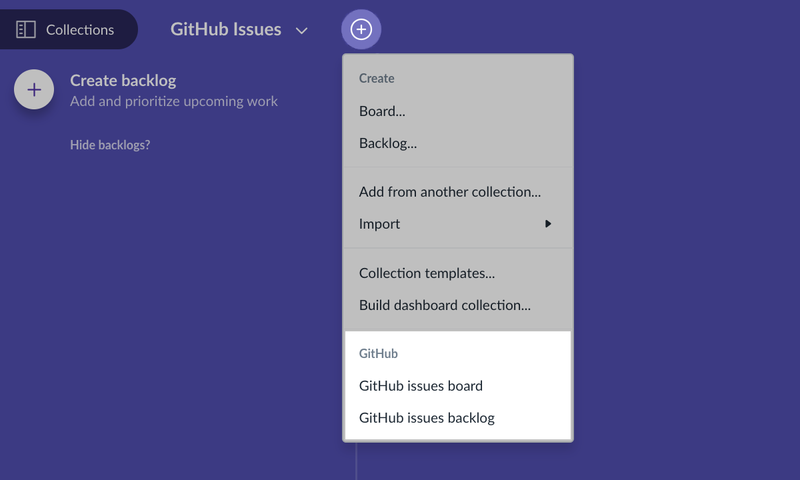 Next step is to create a issues board or backlog and connect it to your GitHub repository (you will only be able to connect repositories you are an owner of). Click the + Icon next to the name of your collection in the top left corner. You then need to allow access and sign in to your GitHub account. 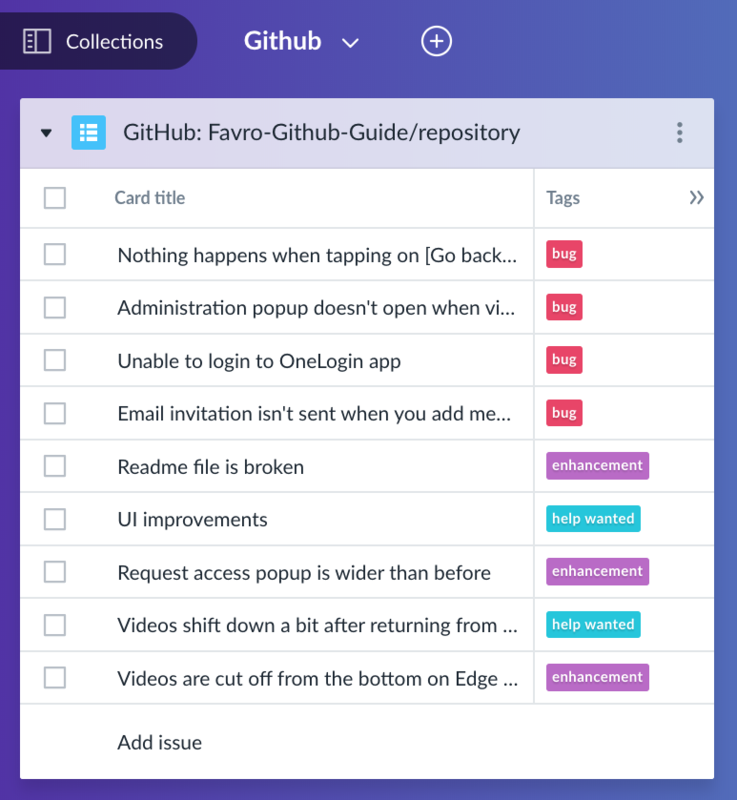 Once you have authorized access to Favro, choose a GitHub repository to connect to the new board or backlog. Also choose whether to sync both Issues and Pull Requests or select only one of them. You can also choose which columns to map to which GitHub labels, either use the pre-entered columns or customize after your own liking. When you’re done just click Create GitHub board/backlog. A new backlog has now been created and filled with your GitHub Issues and Pull requests. ...If you've created a board it can look something like this. It is possible to re-map your columns and also to create new columns and map them to GitHub labels afterwards. Just click the name of the column and choose a GitHub label to map to that column. If no label is specified for a column, all open issues in GitHub will be mapped to this column. Labels are mapped to a Favro tag with the same name. Comments (if a non-Favro user posts a comment in GitHub, Favro will display the GitHub username and avatar for the user). Changes in Favro are immediately synced to GitHub. However, some changes from GitHub will not be updated directly in Favro as they are not exposed by GitHub’s APIs and webhooks. Whenever you open a card in Favro, it will sync any changes from GitHub. 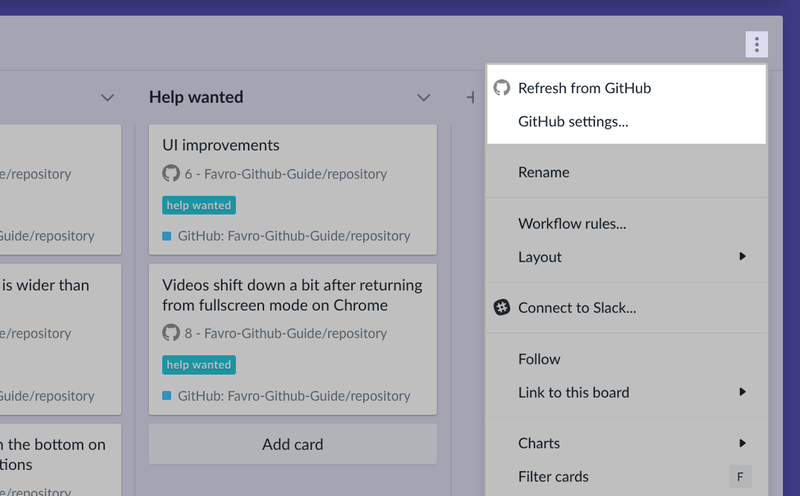 It is also possible to refresh all issues from the repositories mapped to a Favro board or backlog by choosing Refresh from GitHub from the (⋮) menu of the board or backlog. 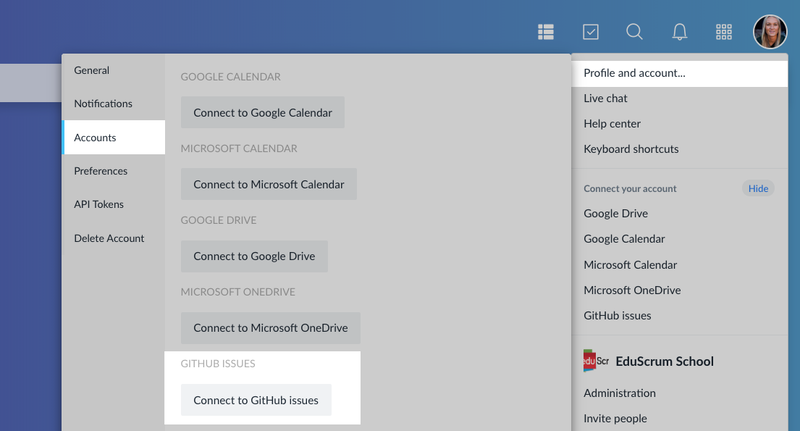 From the same menu you can also open the GitHub settings to connect more repositories to your Github board. 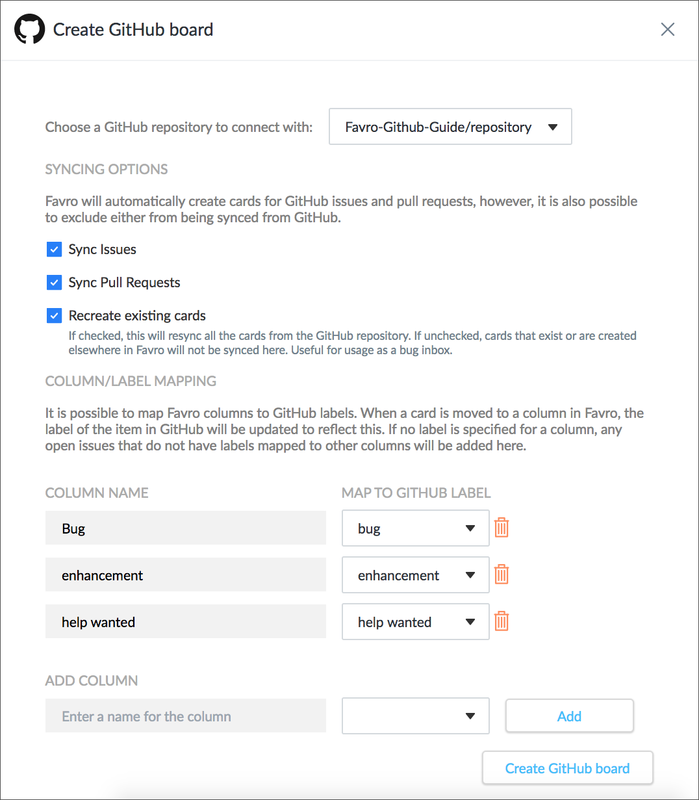 Now that you know more about integrating your GitHub Issues with Favro, you might be interested in learning about the GitHub Source Control Integration where you can move cards on boards via commit or pull request.